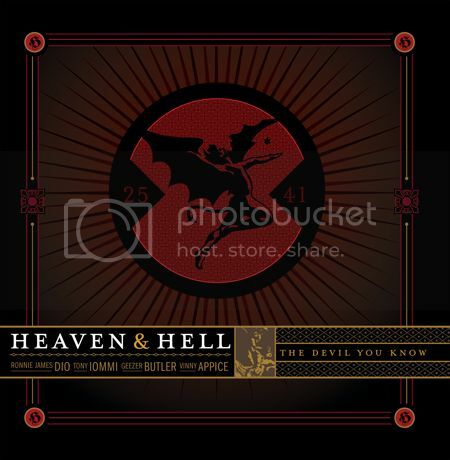 "The Devil You Know", the debut album from HEAVEN & HELL — the band featuring BLACK SABBATH members Tony Iommi (guitar), Ronnie James Dio (vocals), Geezer Butler (bass) and Vinny Appice (drums) — is available for streaming in its entirety on VH1.com's The Leak. BLACK SABBATH fan site Black-Sabbath.com has revealed the details of several "exclusive" physical and digital retail versions of "The Devil In You", which is scheduled to arrive in North America on April 28 from Rhino for a suggested list price of $18.98 (physical) and $9.99 (digital). The effort will also be released as double vinyl LP featuring a laser etched design and exclusive poster on May 12. * Wal-Mart will offer an exclusive alternate cover (see image below) that prominently features the traditional BLACK SABBATH devil logo. When finalizing the cover, the band narrowed it down to their two favorites but had a difficult time making a final decision. Now the alternate cover will also be available as a Wal-Mart exclusive. * iTunes will offer an exclusive version with previously unreleased live recordings of "Die Young" and "I" from the band's 2007 European tour. 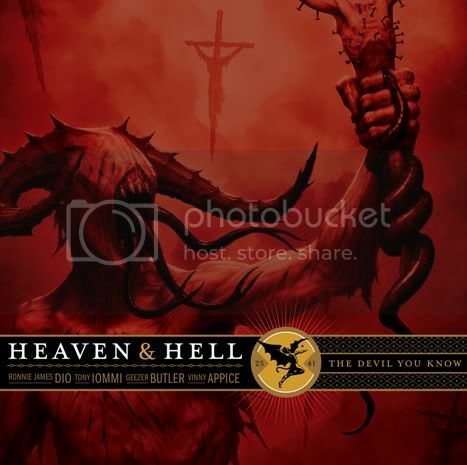 * Select independent retail stores will offer exclusive HEAVEN & HELL T-shirts and/or copies of the album signed by the entire band, while supplies last. See below for a list of all participating stores and contact them directly for more details. * Record & Tape Traders - Washington D.C.
Pre-order now from Heavy Planet!